It’s no secret – we love spooky games at Dice Hate Me. There’s just something rich and engaging about a dark setting done well. We don’t play scary games as often as those with other themes, but when we do, we like to do it right – and we like to share our experiences. And, so, in the spirit of this most bewitched month, here’s a look back at some of those spooky games we’ve played and shared – and a fresh look at a new addition to the library! In the boardgaming world of late, and much like the shambling undead upon which they are based, zombie games just keep coming, wave after wave, until you often feel as though you’ll never see daylight again. Quite often in these games, you’re doing your darndest to stretch your cursed existence as long as possible, hoping upon hope that your story is written by Robert Kirkman and you get to issue 100 without losing a limb. If I’m Going Down, however, does things a little differently; in this game, it’s not a matter of survival – you know you’re a goner – it’s simply a matter of taking as many of the cannibalistic freaks down with you as you can before you bite the big one. And that, dear readers, is just enough of a fresh twist to make the game intriguing. 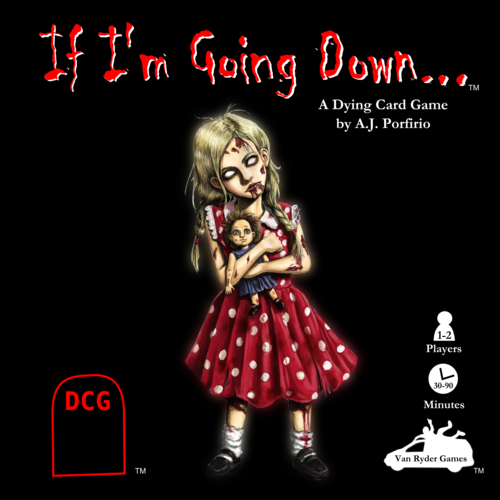 At its core, If I’m Going Down is a fairly straightforward card game where you and up to one other hapless survivor are holed up after the apocalypse, fighting off hordes of the undead. Initial set-up is guided by a graphical layout depending on the scenario you choose, and it’s pretty simple to get the fight going. 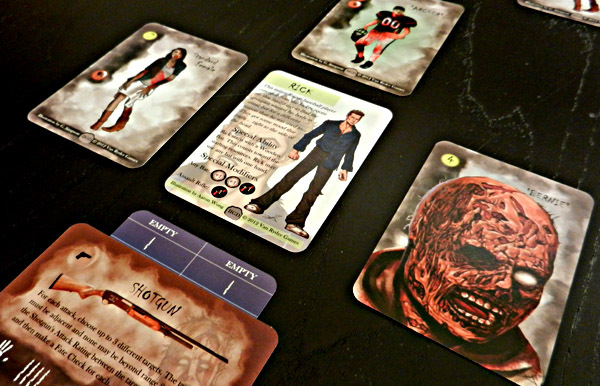 The gameplay, however, can be a far bit trickier, with lots of “cards with words” that create variable occurrences, weapons and items that require a bit of mental inventory, and an attack system that requires you to apply your weapon’s attack rating plus or minus any modifiers in Kill Points that must be equal to or greater than the zombies “Z Rating” plus Range (did you get all that?). Despite some of the math and a couple of rules quirks, once you get a couple of zombie kills under your belt, the whole system falls neatly into place and the game takes on a comfortable, albeit tensely atmospheric, rhythm. Surrounded by evil, low on gas. As much as the unending onslaught might seem to rule this game, the real star of the show is in the system of resource trackers. There are three trackers in the game – hands, body and ground – and they are used to store and keep track of the number of uses of several items and weapons. Got a shotgun? That requires two hands and takes up both sides of the hands tracker. Use an action to shoot it and you move it up one usage space on the tracker. When it’s empty, either chuck it out of the shack or lay it on the ground (if there’s space) until you find more ammo. It’s a very intuitive system that offers fitting utility in If I’m Going Down‘s card-based world. Overall, If I’m Going Down provides some fairly easy zombie-slaying fun in a small package. And although it’s fun with two, it’s surprisingly more tight with one player. I’m not normally a fan of solitaire games, but If I’m Going Down‘s theme, atmosphere, and straight-shuffling zombies make it far more engrossing than one might think when facing the reaper all alone. Impression score: 4.5 out of 6 – For zombie fans, it’s a no-brainer. One of my personal all-time favorite games is Arkham Horror. Monkey238 has only played it once, but it was earlier in her gaming career, long before she knew the importance of strong sanity and a trusty shotgun. Now that she’s more well-versed in the Mythos, she’s itching to try it again, and I will gladly oblige. That one play of Arkham Horror, however, paved the way for her to seek more adventurous forays into Lovecraft, some great (Elder Sign), and some where the stars were oh-so-very wrong (Mansions of Madness). 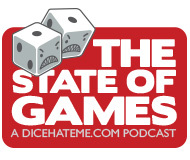 Perhaps our deepest delve into Arkham Horror and its horrific realms was in our very first interview with designer Richard Launius on The State of Games. In this special podcast, we learned the origins of the game and asked whether it was just a coincidence that Richard has more than a passing resemblance to Howard Phillips Lovecraft. Although there has never been a proper review of Arkham Horror on Dice Hate Me, I did explore the misty streets and coves of Kingsport in what continues to be my favorite big-box expansion. Climb aboard the White Ship and explore Kingsport Horror! There may be a Lovecraftian game out there greater than the fabled Arkham Horror, and its name is Elder Sign. I may catch some flak for that from some purists, but Elder Sign can often be both more dramatic and more approachable than its older, more prosaic cousin and I can prove it. Thankfully, they were both developed by the same lead designer – the talented Richard Launius. Win-win? You bet your Azathoth. Not all things Cthulhu needs to involve massive amounts of time, tons of cardboard and an asking price well above Ulysses S. Grant – take The Stars Are Right, for instance. This game takes the Mythos and posits an interesting – and, often, brain-melting – twist. Seriously, this game will make your brain hurt. Just like the Elder Gods would have wanted it. When AEG first introduced Nightfall, my first thought was “oh no, not another deckbuilder.” Then I took a step back – the game has werewolves, zombies, vampires, and direct player interaction. Maybe this isn’t so bad, after all. Thankfully, my step back was worth it – Nightfall turned out to be one deck-builder I actually enjoyed, even if some of the players around me weren’t so thrilled with all the slashing, biting and brawling. Despite what you may read in this review, Panic Station has one thing going for it: Atmosphere. The game channels so many subtle fears that can’t be ignored – the unknown, an alien force, traitors and claustrophobia. Unfortunately, it asks a bit too much from most players in order to maintain that apprehension. Primarily a misunderstood and often misplayed game, Panic Station can still be a grim and grisly game to grace your table during the wee spooky hours. Last year about this time, Monkey238 and I spent a whole podcast talking about our favorite games to play after dark. It was a fun, fright-filled evening of just expressing our love for all things spooky and supernatural – all in cardboard form, of course. When you get a chance, pour a glass of your finest red – sure, it can be wine – and get ready for some ghoulish gaming!